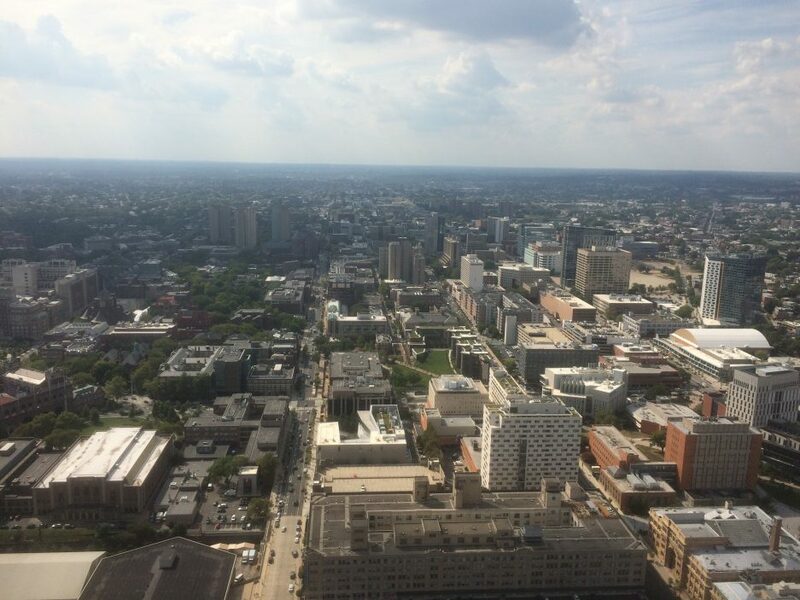 The extended-stay lodging chain's third Philadelphia location sits at the pinnacle of "Philadelphia's first vertical neighborhood." It also marks the latest step in a continuing evolution for the brand. By Sandy Smith·	 9/12/2016, 7:45 a.m.
Those of you of a certain age may recall the TV ads for KormanSuites, “when just an apartment just isn’t enough.” The apartments the Korman family offered under that brand came with extra services and amenities — including furniture if you wanted it — and something other apartments at the time didn’t offer at all, which were leases of less than a year’s duration. The KormanSuites brand was the brainchild of Larry Korman, the oldest of the fourth generation of Kormans to run the family real estate development and management company, and it revealed the existence of a hitherto undiscovered market: people who wanted a nice place to live that offered more than a short-term hotel room could but didn’t need to be tied down to that place for an entire year. 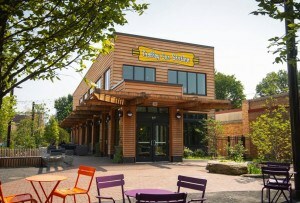 The “extended stay” residence industry that sprang from that discovery has also grown and matured since then, and Korman has continued to play a role in its evolution with its extended-stay residence brand, AKA. 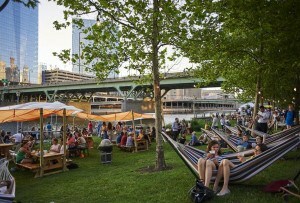 Since opening its first location on Rittenhouse Square in 1997, AKA has grown to become the most highly regarded name in extended-stay lodging, offering ultra-luxurious furnished apartment-style residences and hotel-style services for those who needed a place to stay for more than a few nights but less than a year. Celebrities love the level of service, attention and privacy AKA properties offer (the company is glad to share their references with you). So do executives and other business travelers who need a “home base” that actually feels like a home for a little while. 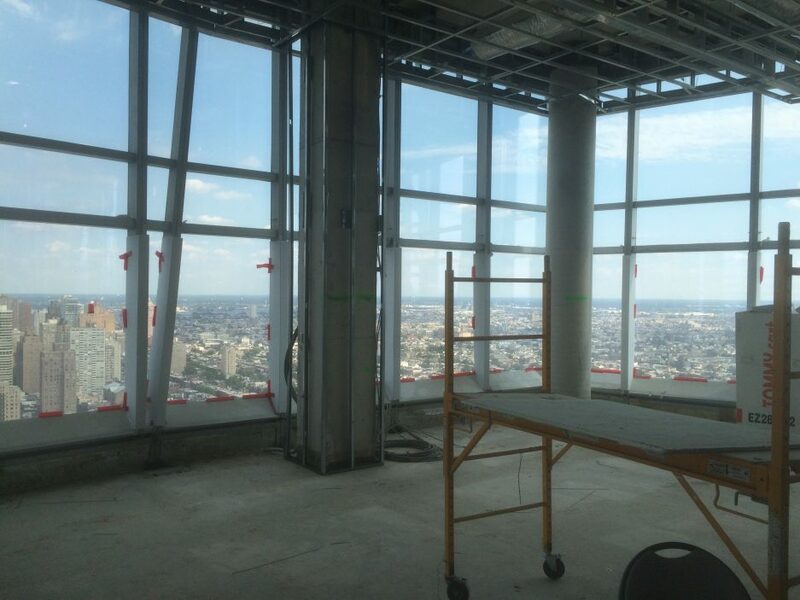 Now, as AKA gets its third Philadelphia location (and its 11th worldwide) ready for its closeup, AKA University City General Manager Evan O’Donnell offered to let us take a look around the work in progress. 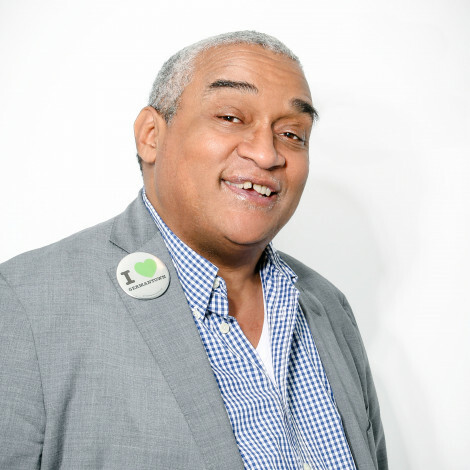 The tour also offers an opportunity to catch up with some of the other changes that have taken place at AKA locally over the past year. 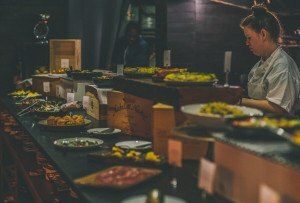 So, before the pictures, some words on those changes. 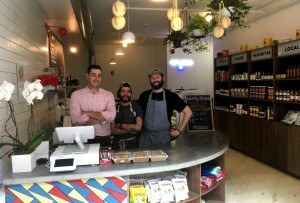 The pioneer AKA location on Rittenhouse Square got some tweaks in both design and offerings that build on its established reputation as the place to stay when you want to stay a while in Philly. 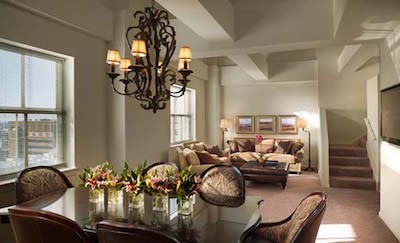 The penthouse suites got makeovers from architect Edward Asfour, who designed its award-winning a.kitchen restaurant, and interior designer Nicholas Cardone. The residence also now welcomes guests who just want to stay the night, or a few nights, as they might at a hotel. 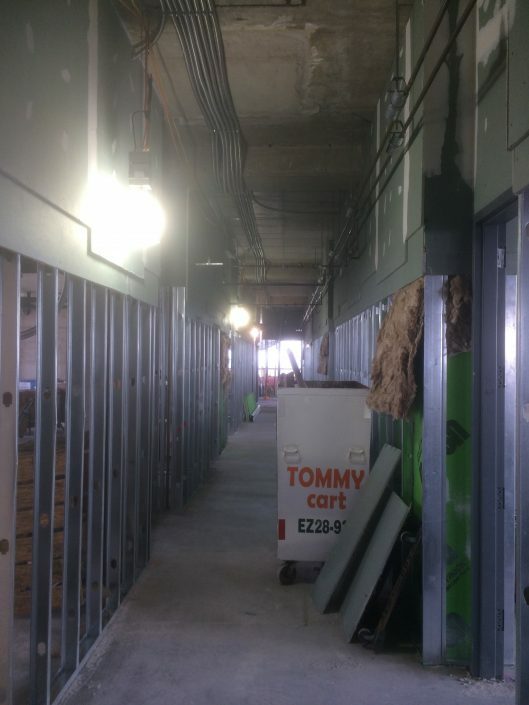 They’ll get the same stylish apartments and extra services the extended-stay residents enjoy. 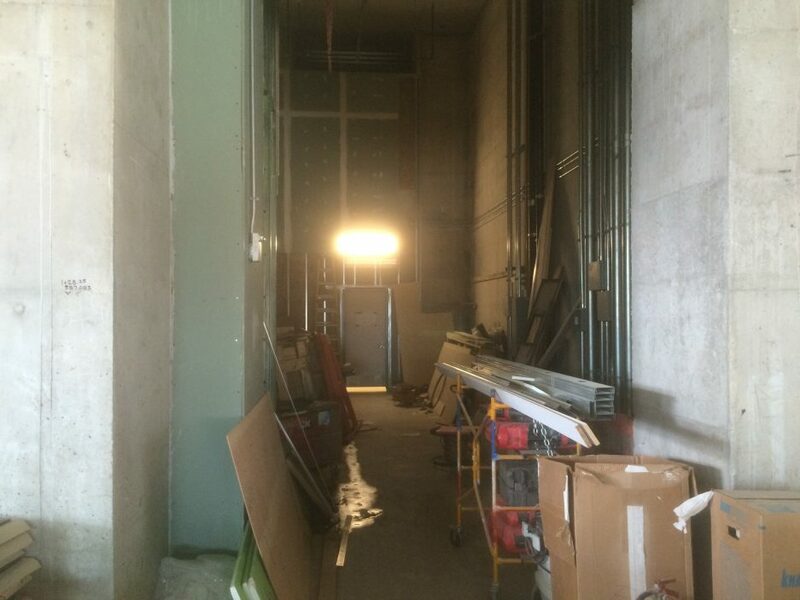 And a new amenity will be added to the array soon: a.cinema, an intimate onsite screening room. 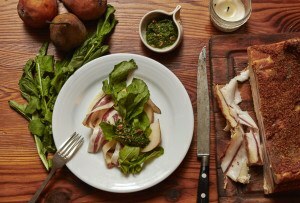 A second AKA opened this summer in The Franklin, the Korman-owned apartment building in Washington Square West. AKA Washington Square, which is an extended-stay residence exclusively, was carved out as part of a larger $13 million renovation of the building that also renewed and expanded its ballroom and refreshed and upgraded its lobby. 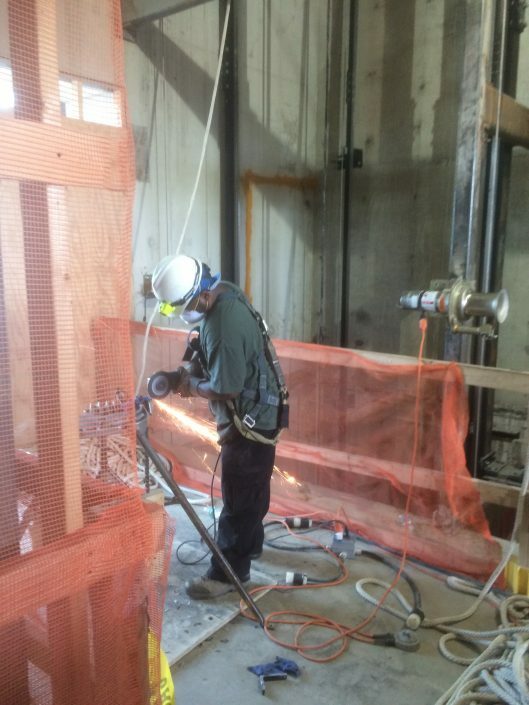 Along with opening AKA Washington Square, Korman added some more “experiential amenities” that will be available to all residents and guests in the building, including a bar and a live music program curated by local singer Eddie Bruce. Joining these soon will be a new restaurant, The Rarest, helmed by CNBC “Restaurant Startup”-winner chef Anthony Marini, and an afternoon tea in the lobby. 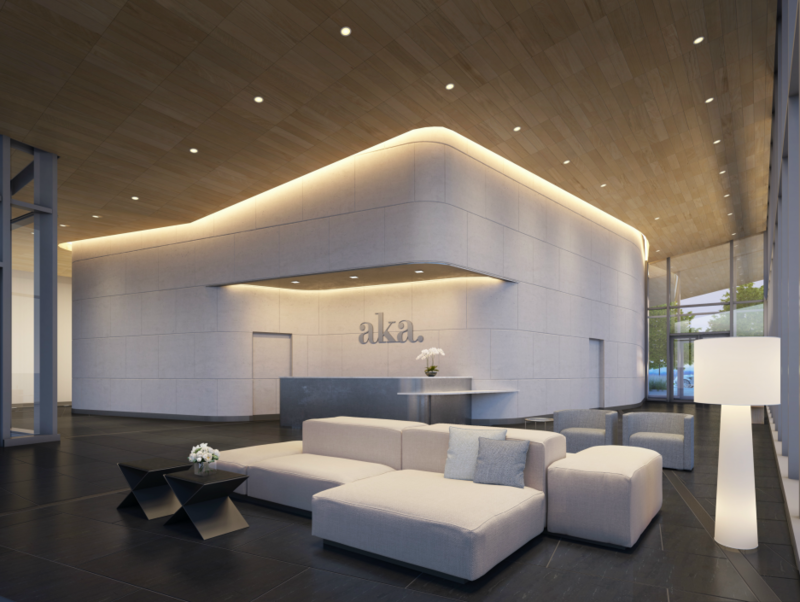 That brings us to AKA University City, the first new-from-the-ground-up property in the AKA collection. 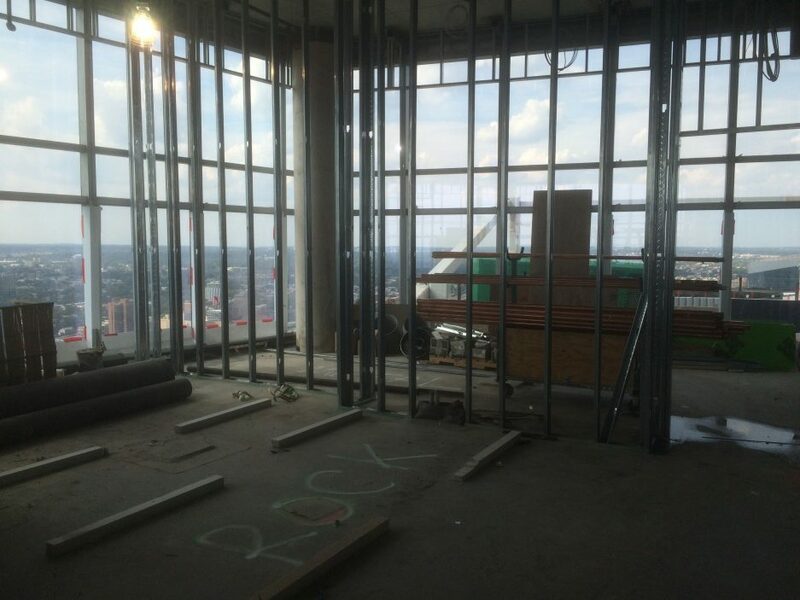 Make that “new from the 28th floor up”: the residence occupies the top 19 floors of the Pelli Clarke Pelli and BLTa-designed FMC Tower at Cira South. 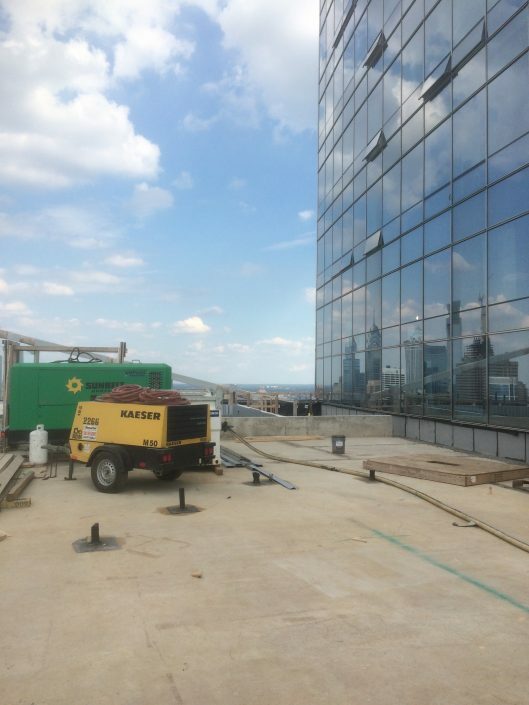 When it opens in early November, it will be the highest hotel in the city, at least until the new Four Seasons opens atop the Comcast Technology and Information Center. 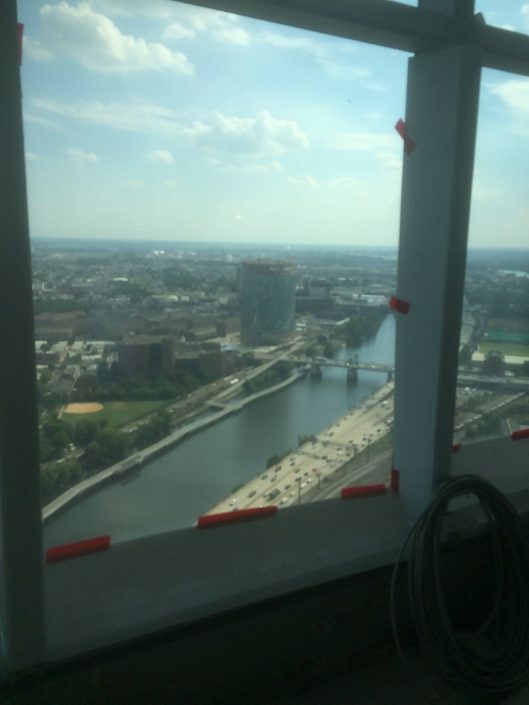 But even after that hotel opens, guests at AKA University City will continue to enjoy breathtaking views of the Center City skyline and the Schuylkill from residences that feature elements designed by Piero Lissoni. 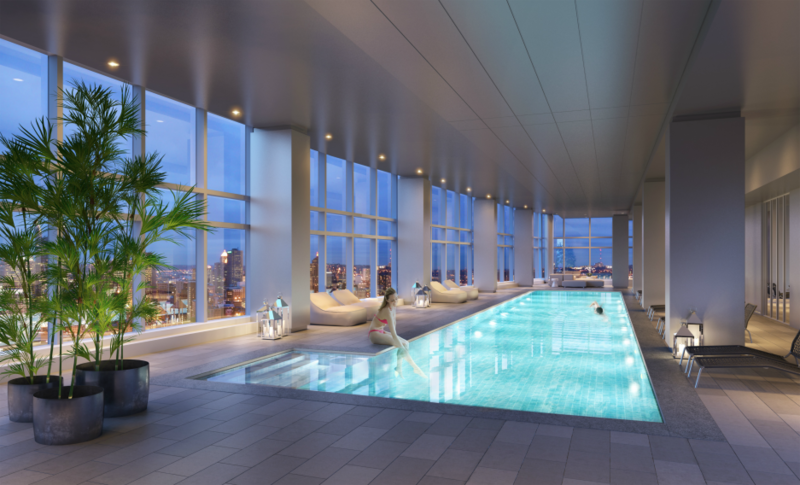 Apartment residences will be available either with or without furniture, and guests may take advantage of extended-stay serviced residences or hotel residences. 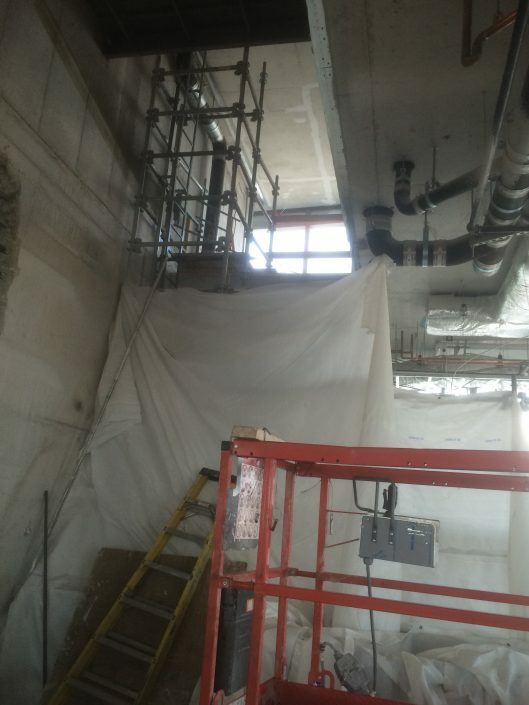 The pictures below give you an idea how far work has progressed on the new residence-hotel as well as a glimpse at what the finished product will look like. 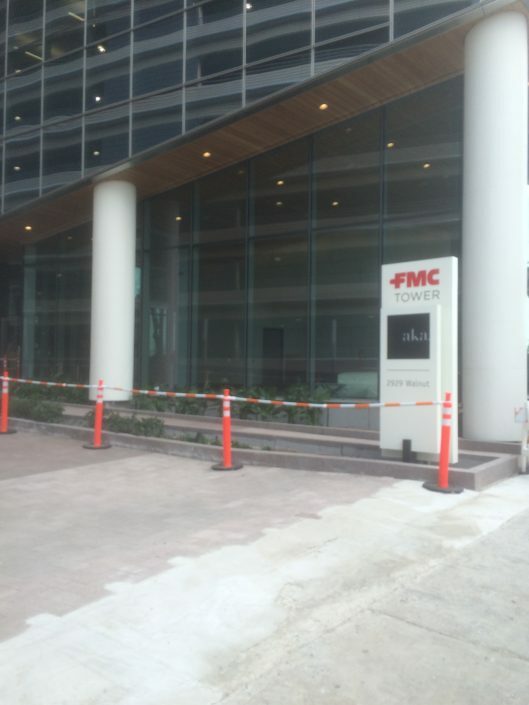 The driveway entrance to the residence hotel and the office tower, which have separate entrances. 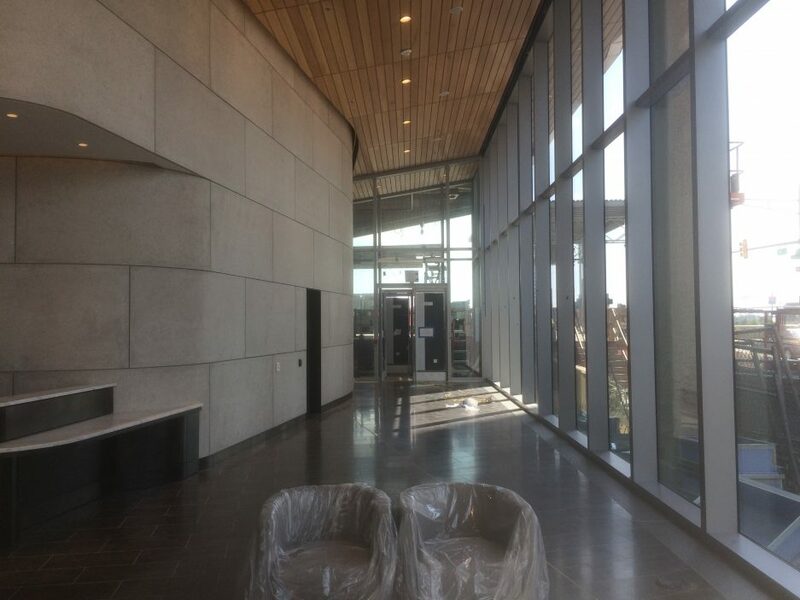 The AKA University City lobby. 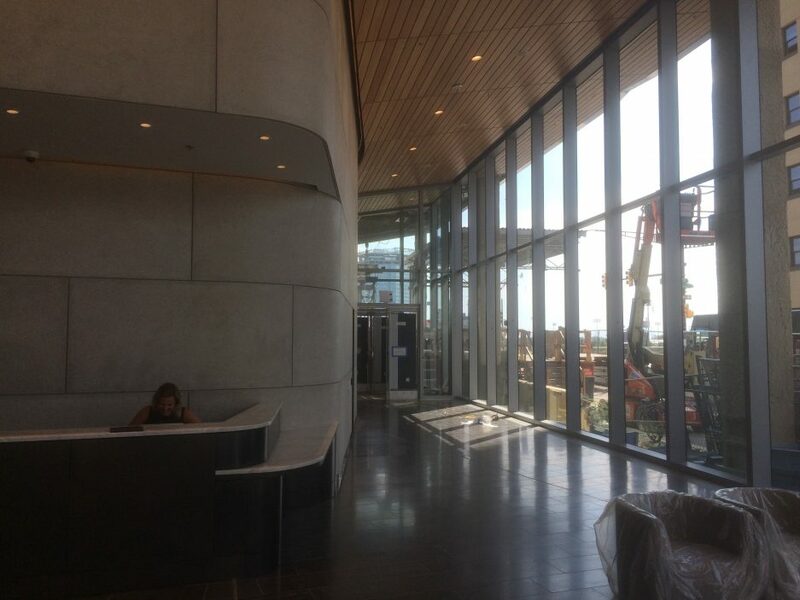 What the lobby will look like when finished. 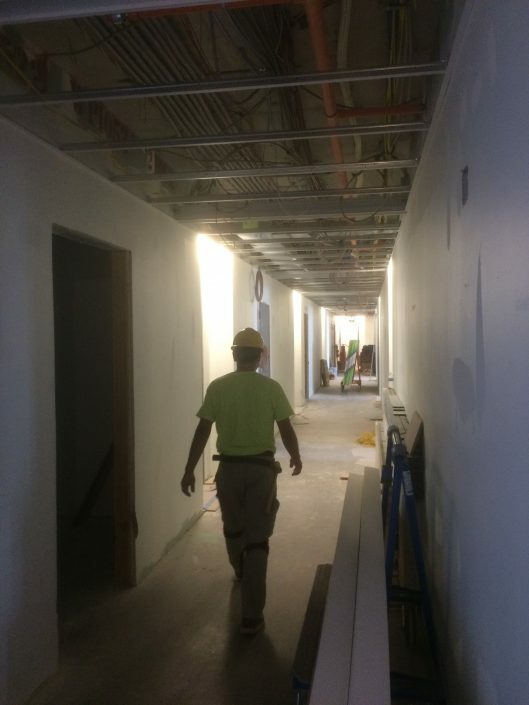 When complete, this hallway will lead to the restaurant. 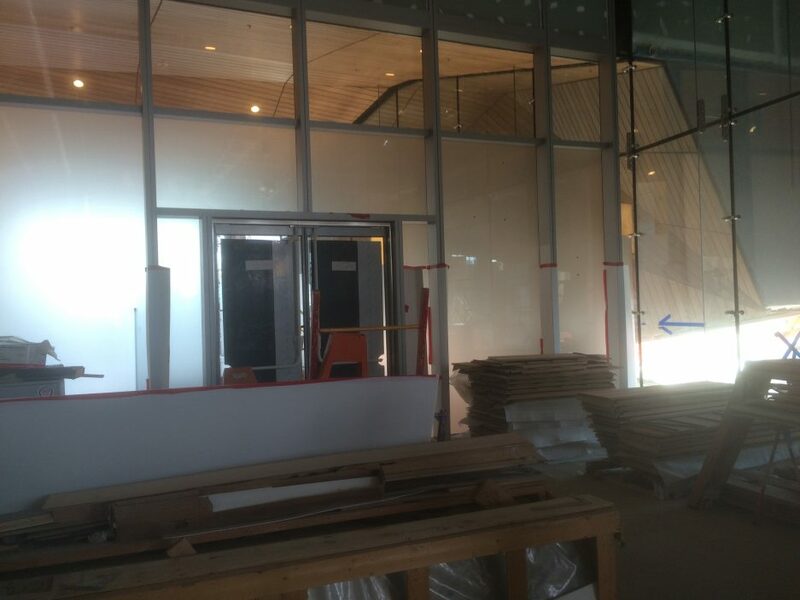 The interior entrance to the restaurant, looking towards the lobby. 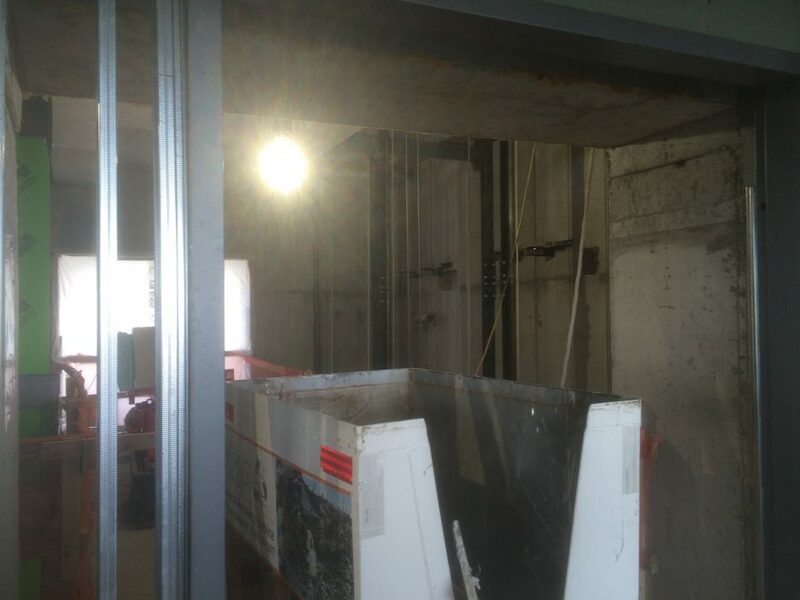 This space will become part of the restaurant once construction is complete. 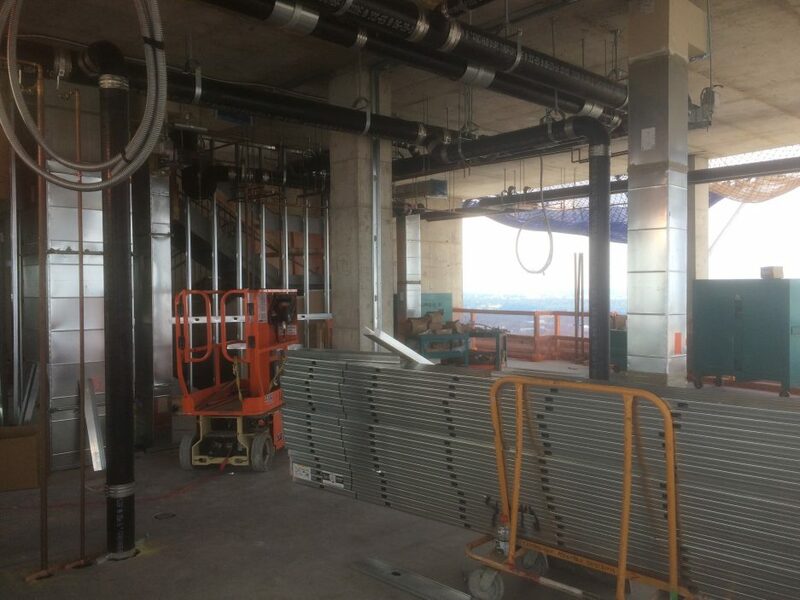 It will have both indoor and outdoor seating; a glass wall will separate part of the area under the roof in this picture from the restaurant interior. 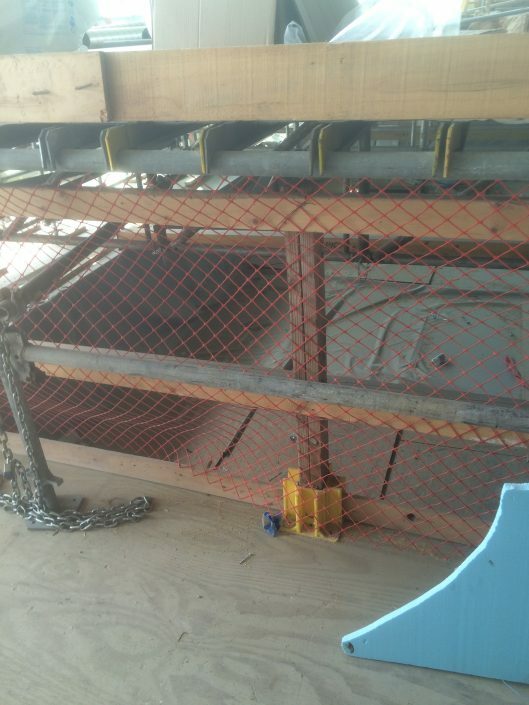 For now, though, the space is used as a waiting area for the construction lifts. 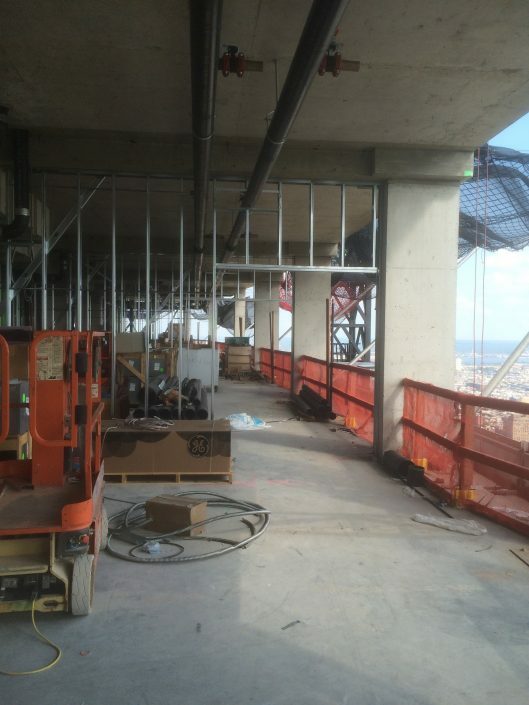 The hallway on the 46th floor, where the penthouse apartments will be located. 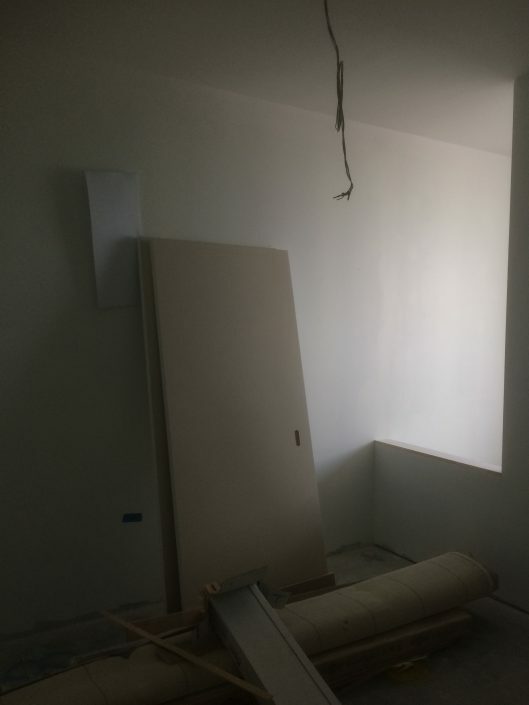 The "interior" of one of the penthouse units, with wall studs ready for installation. 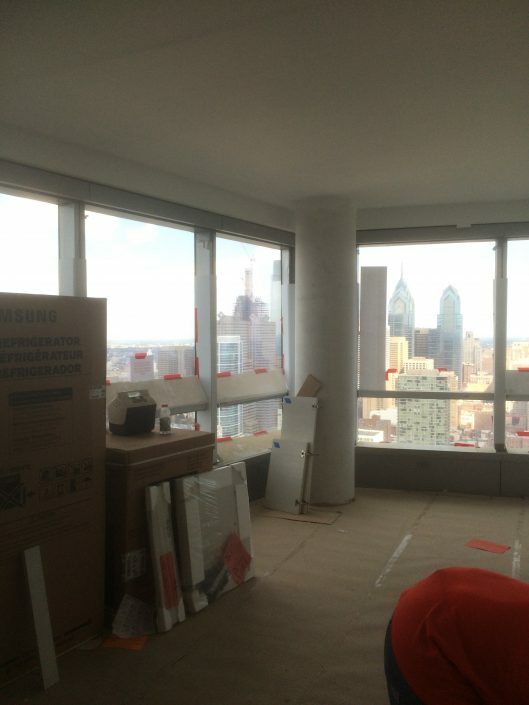 The view of the Center City skyline from one of the east-facing penthouses. 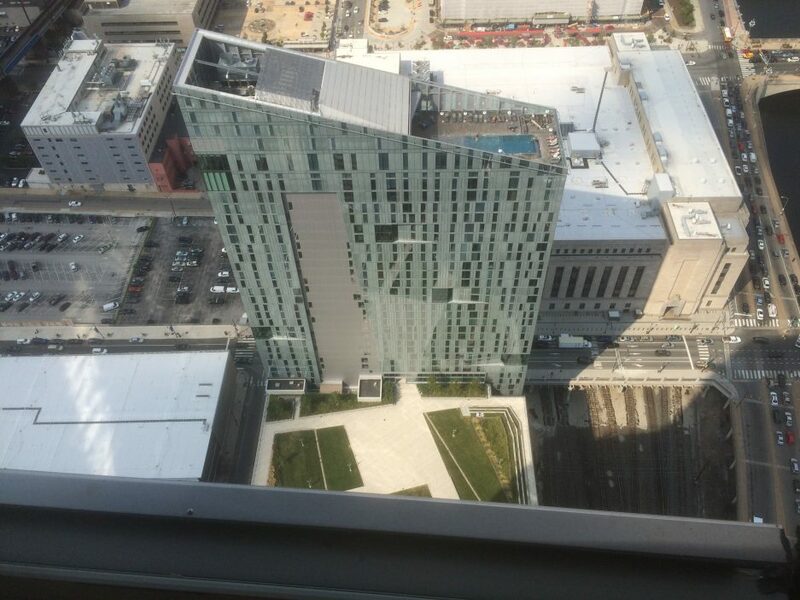 Looking down on Evo and Cira Green from one of the north-facing penthouse rooms. 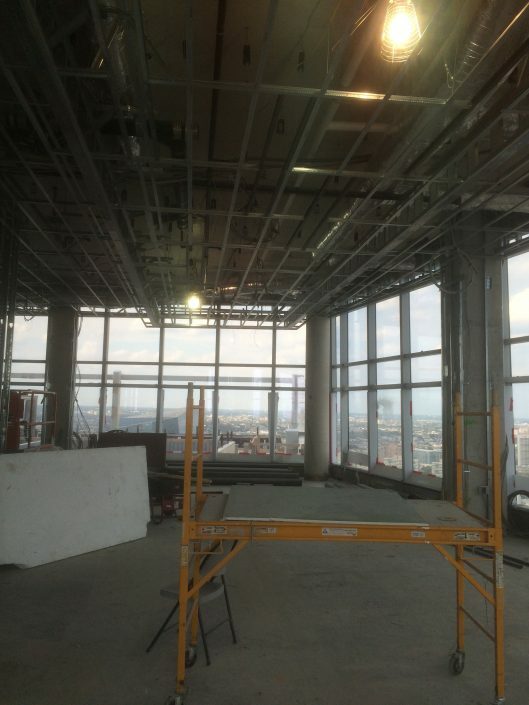 The future elevator lobby on the 46th floor. 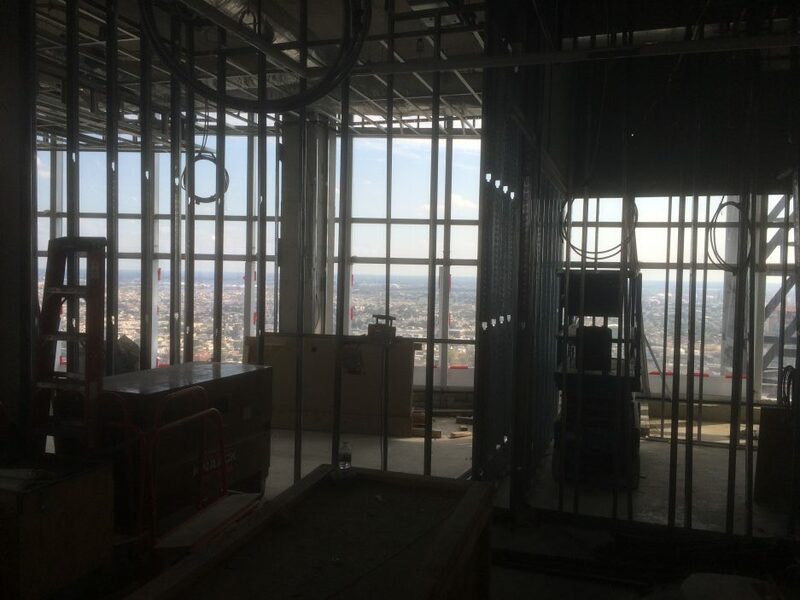 The view to the west from one of the penthouses. 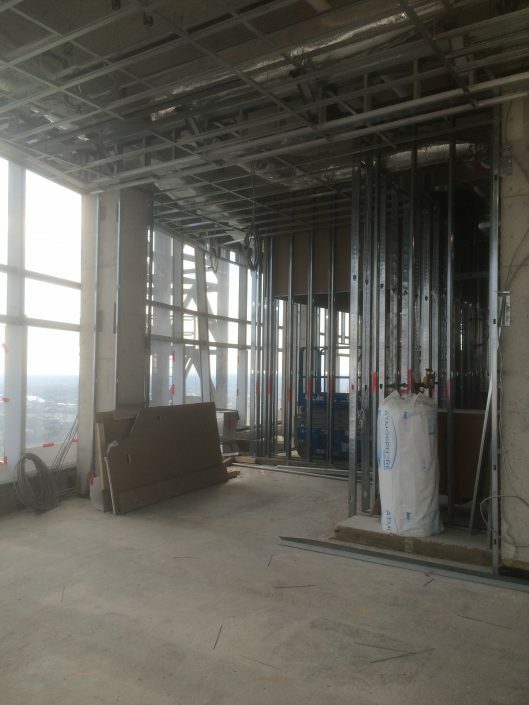 Room dividers along the south side of the penthouse floor. 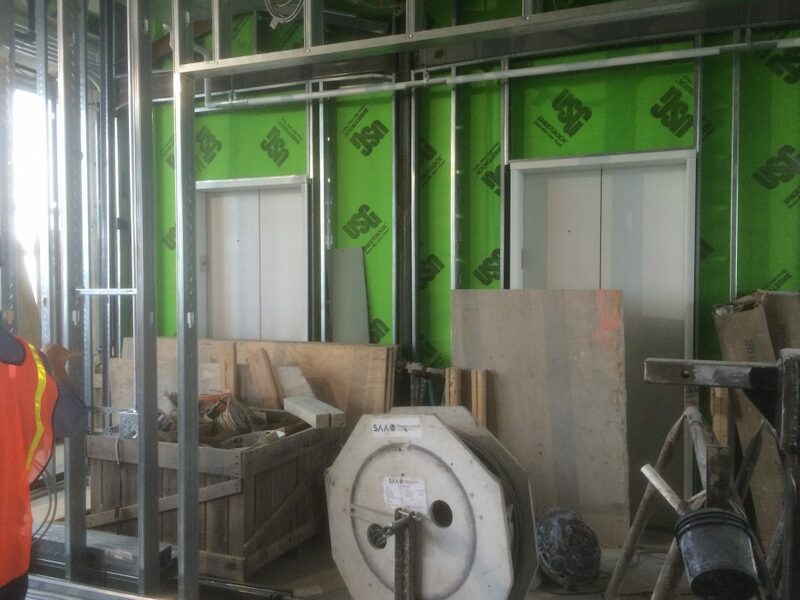 For now, the holes in the stud assemblies allow equipment to pass between rooms. 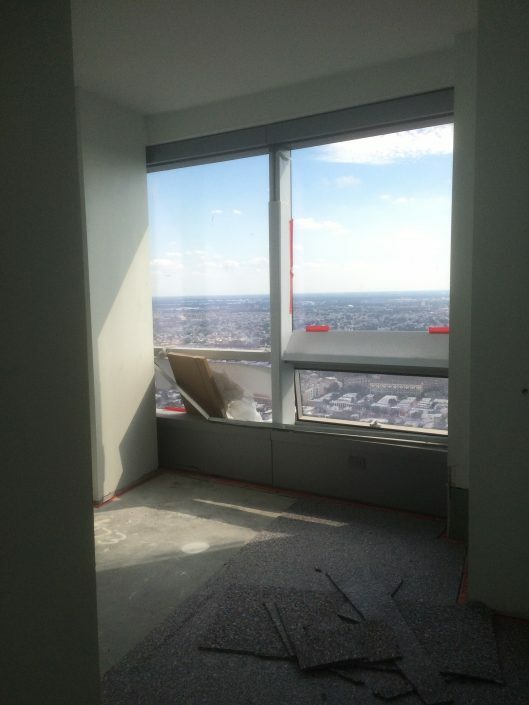 Work is further along on the 30th floor, where several apartments were in various stages of being fitted. 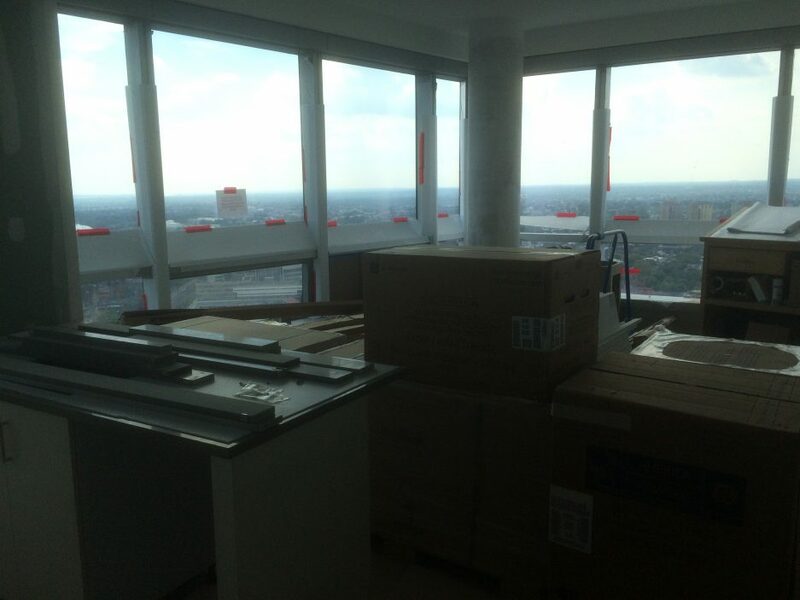 Closet doors awaiting installation in a 30th-floor apartment. 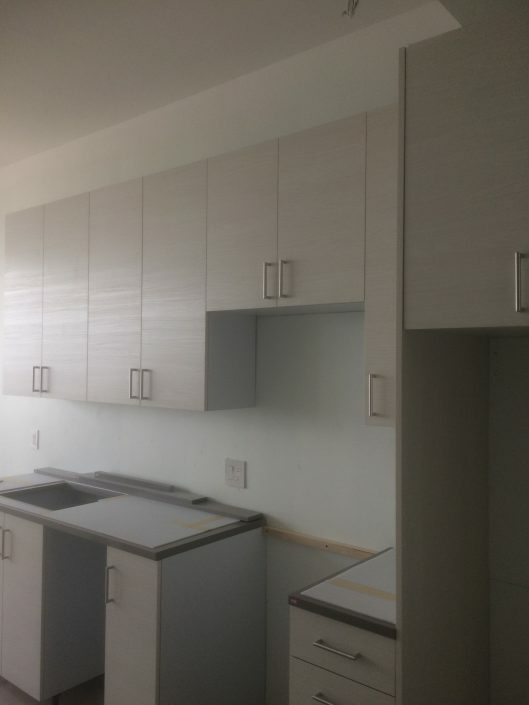 Kitchen cabinets in a one-bedroom 30th-floor unit. 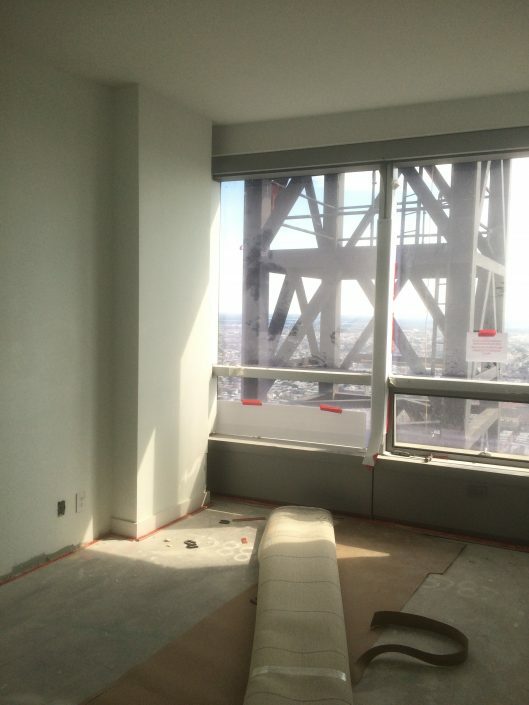 The living room of the one-bedroom unit. 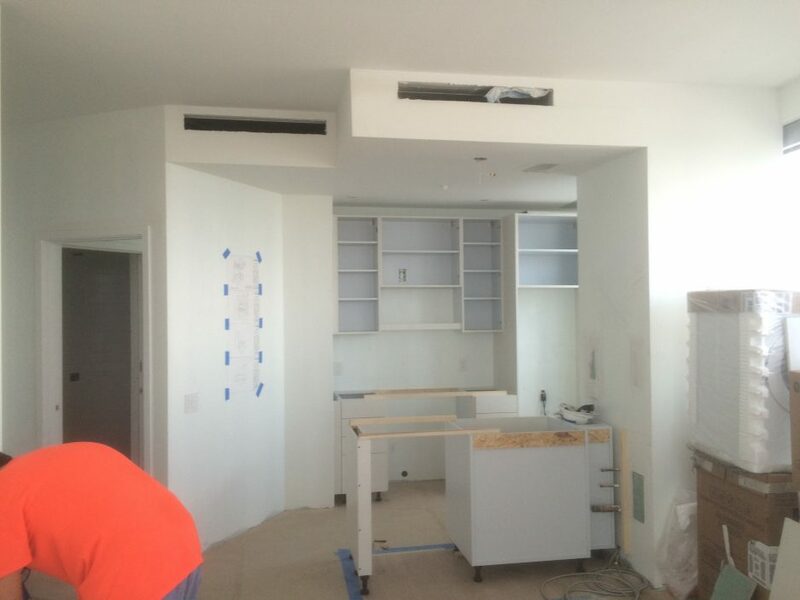 Looking back towards the apartment entrance, showing the kitchen. 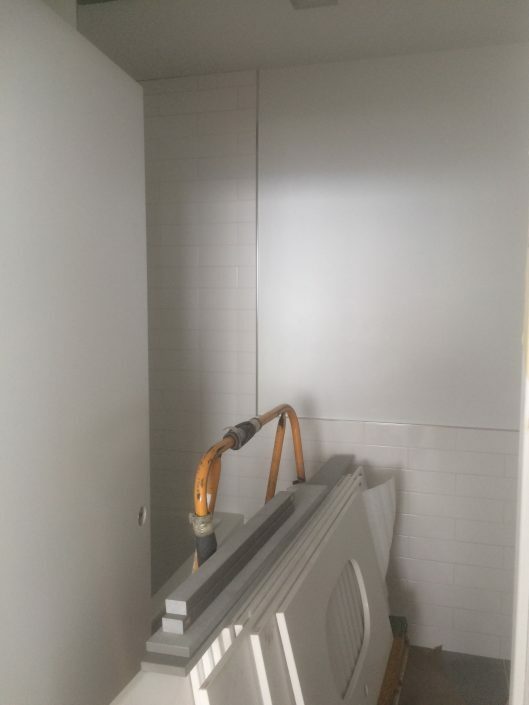 The bathroom in the apartment. This two-bedroom unit has a living room that faces southeast. 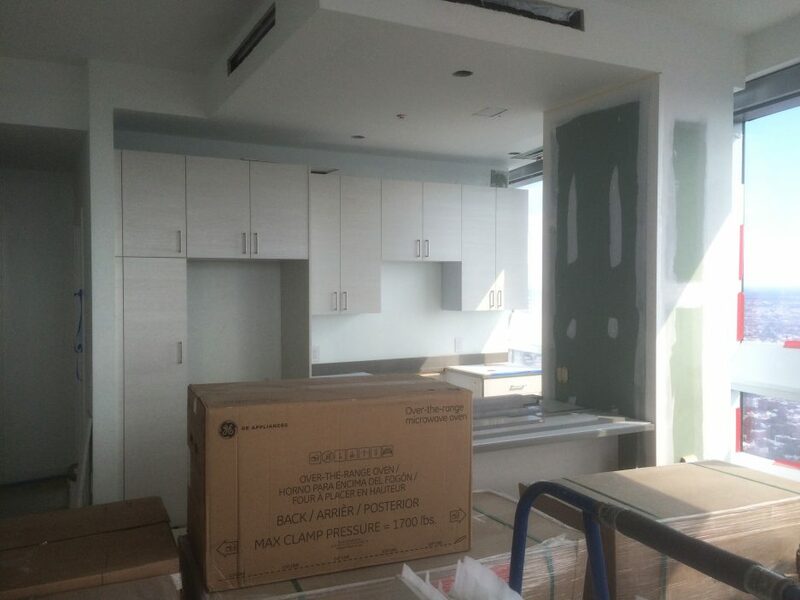 Appliances are ready to be installed in the kitchen of another two-bedroom unit. 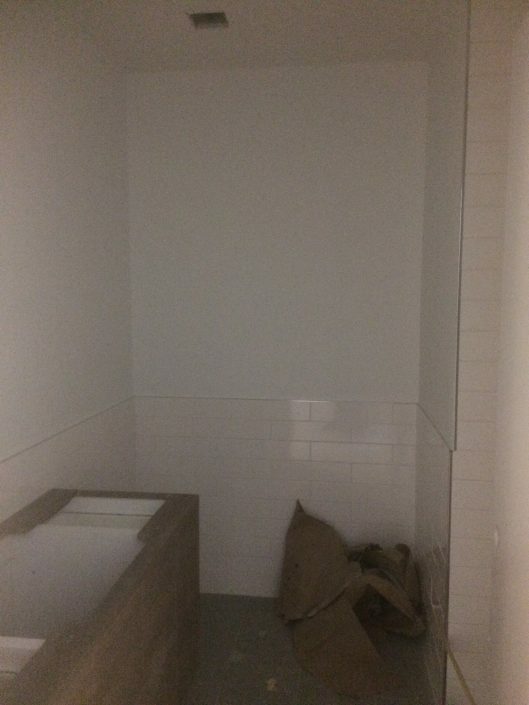 The building's unusual footprint means that units will come in dozens of custom layouts and configurations. 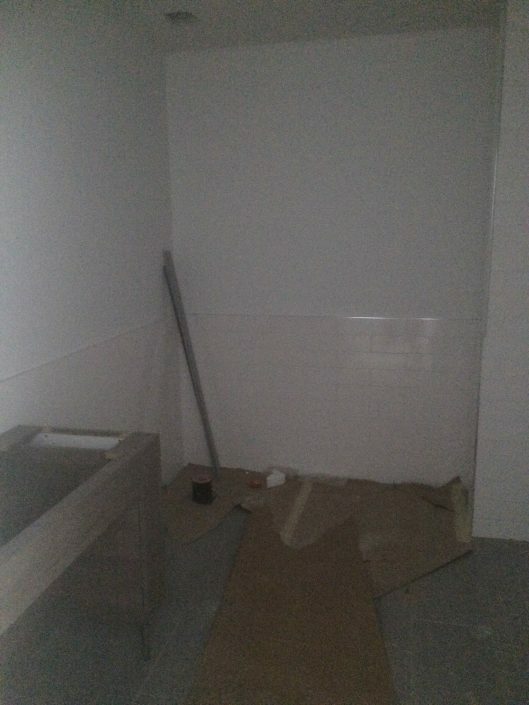 One of the unit's two bathrooms. 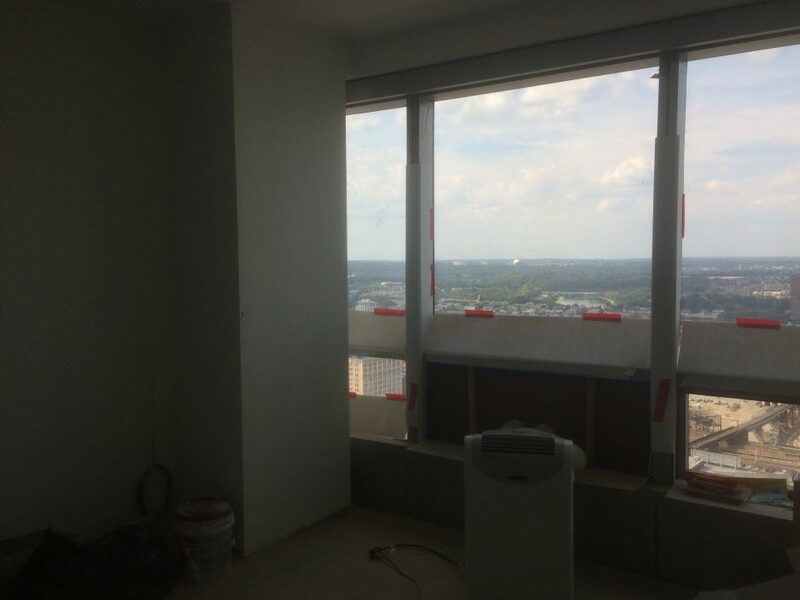 The view to the south from this apartment bedroom will improve once construction is complete and the crane is dismantled. 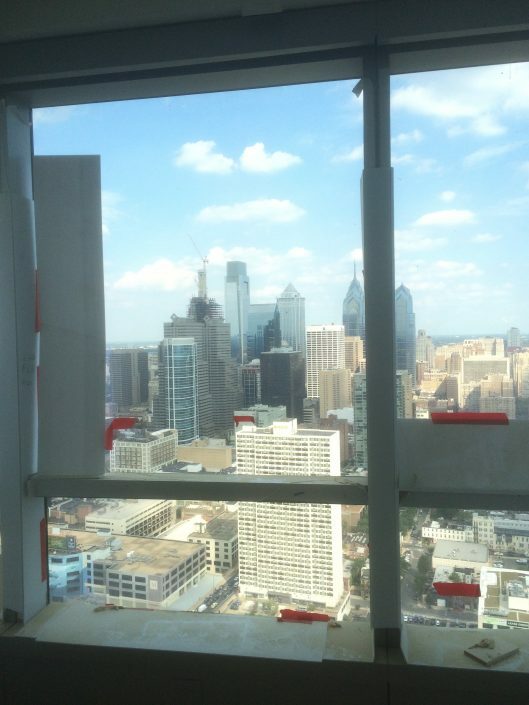 The Center City skyline view from one of the nearly-finished 30th-floor units. 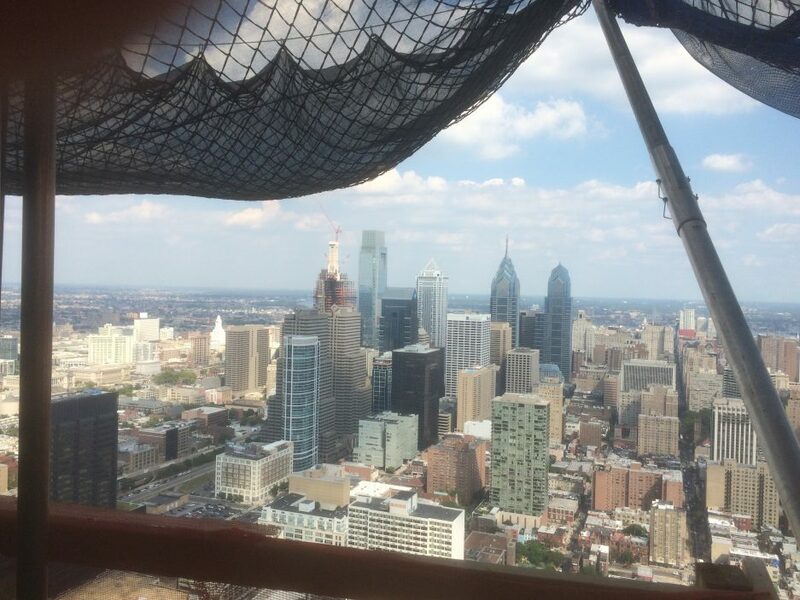 A closeup of that view. 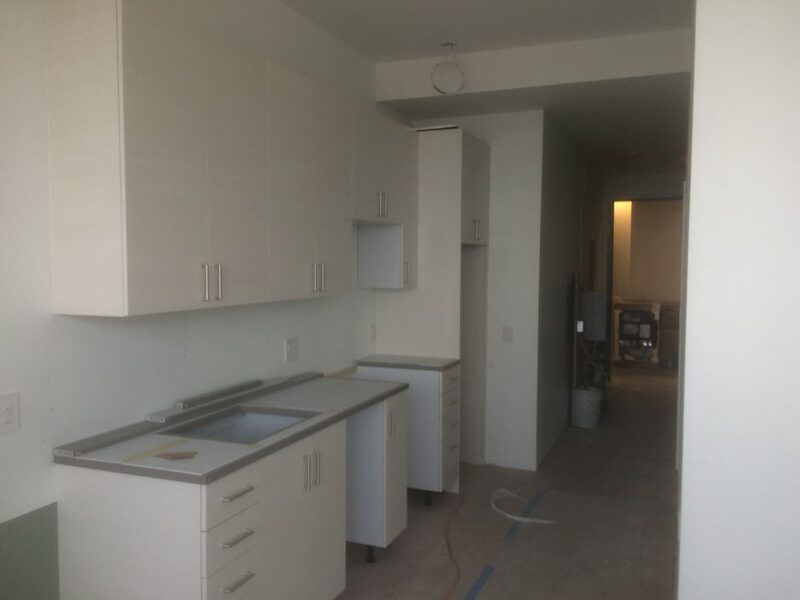 The kitchen in that unit will include an island. 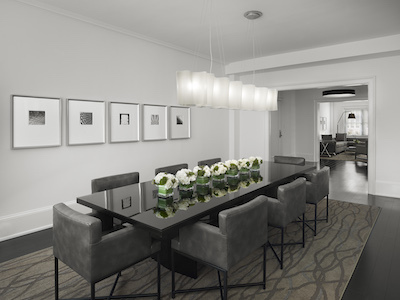 This rendering shows a finished apartment similar to the one containing that kitchen. 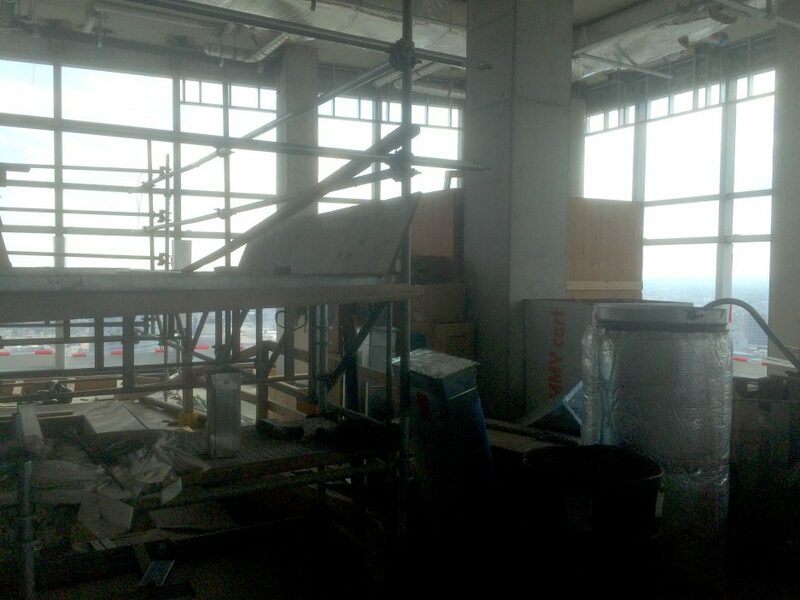 The elevator and stair lobby on the 28th-floor amenities level. 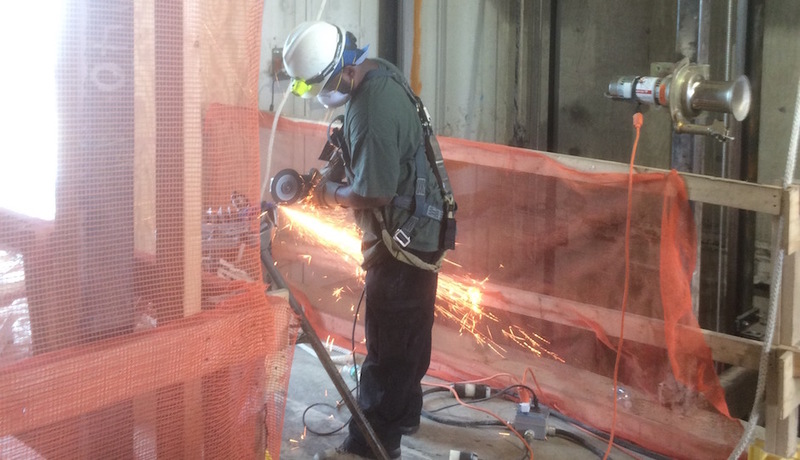 Pipe-cutting in progress on the amenities level. ...and here, on the other. What the pool will look like when finished. 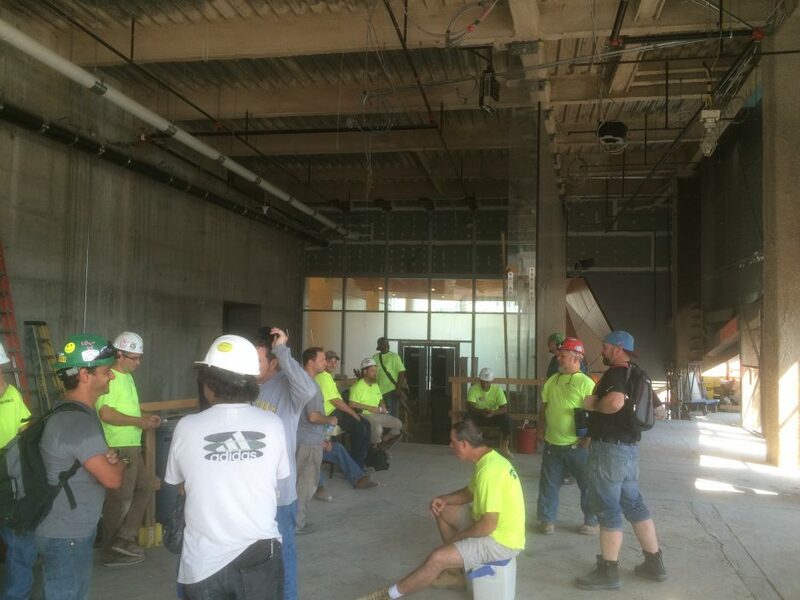 The amenities floor will also include a private dining room, seen here, and meeting space. 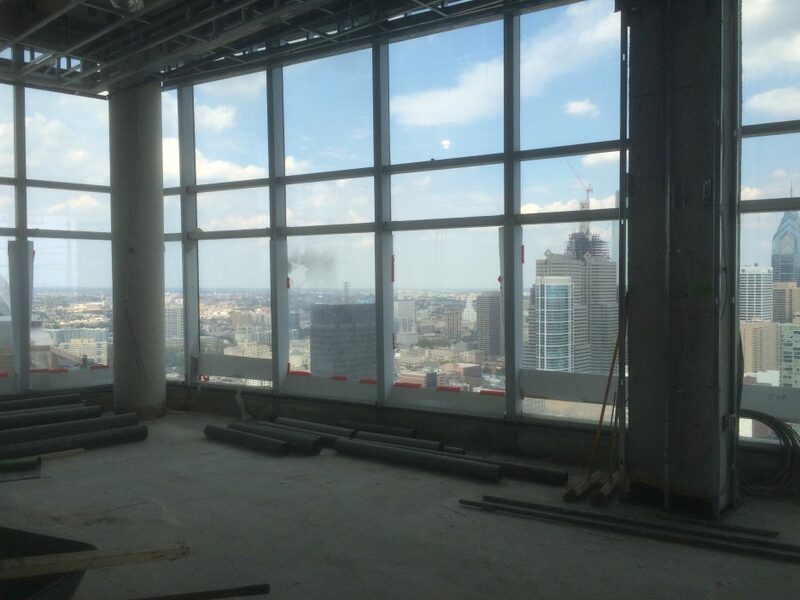 These spaces along the south side will become the business center. 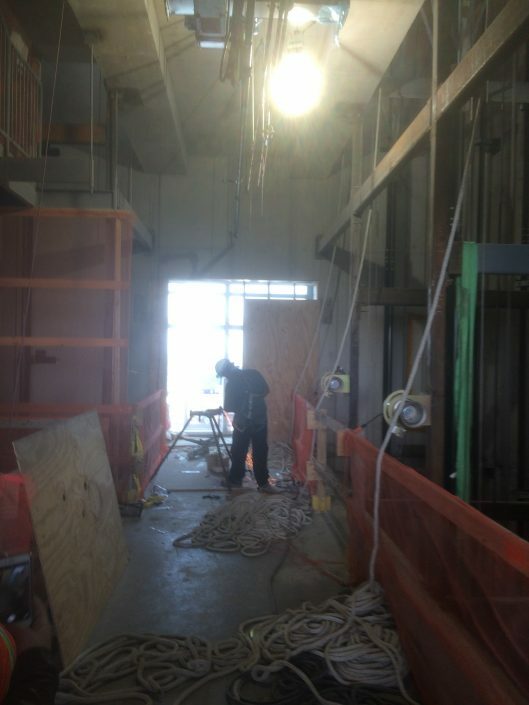 Looking from the future yoga studio towards the future gym. 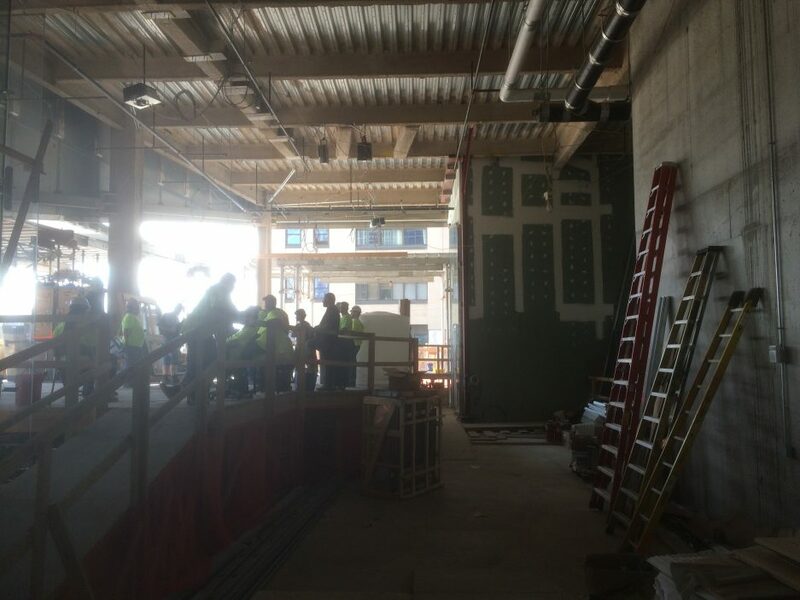 A view from the future gym towards the business center. 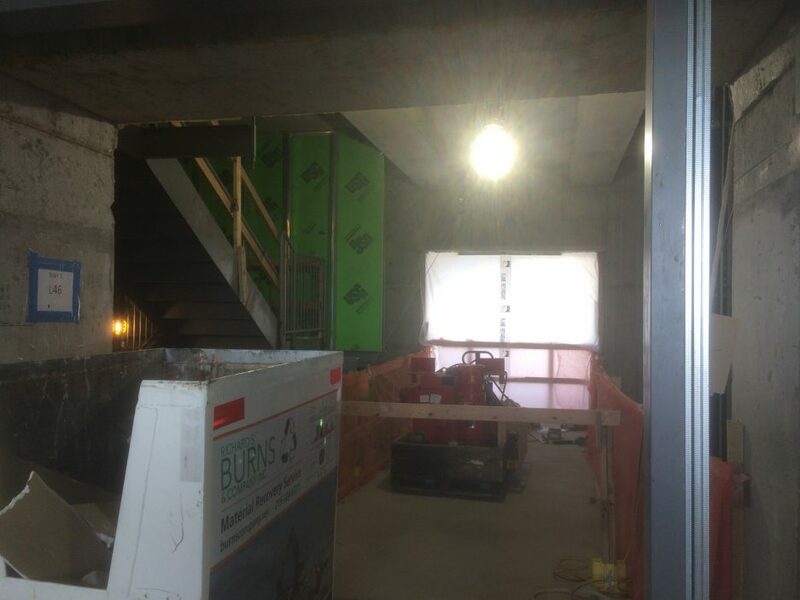 The yoga studio space will include a stairway to the floor above, which will be installed here. 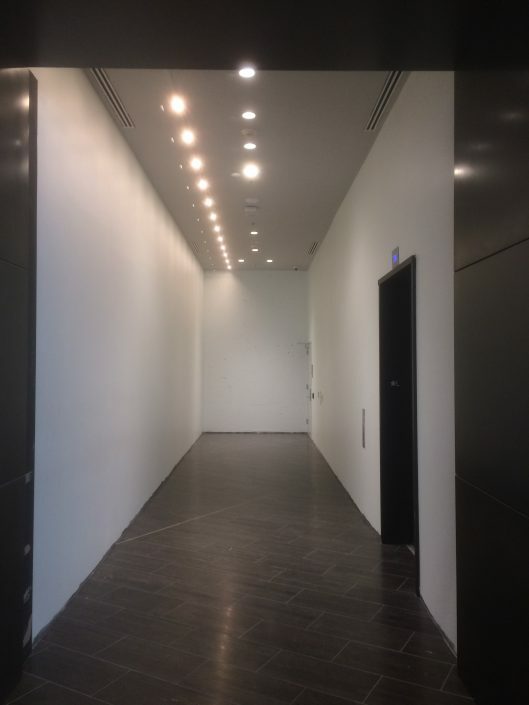 The amenity floor will also be available for use by office tenants, who will access it via these elevators already in service. 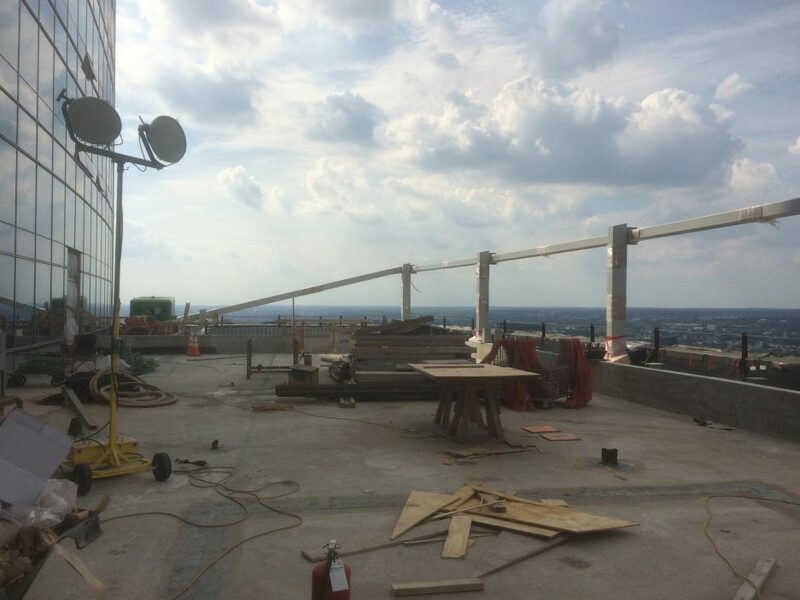 The view to the east from the future a.terrace. 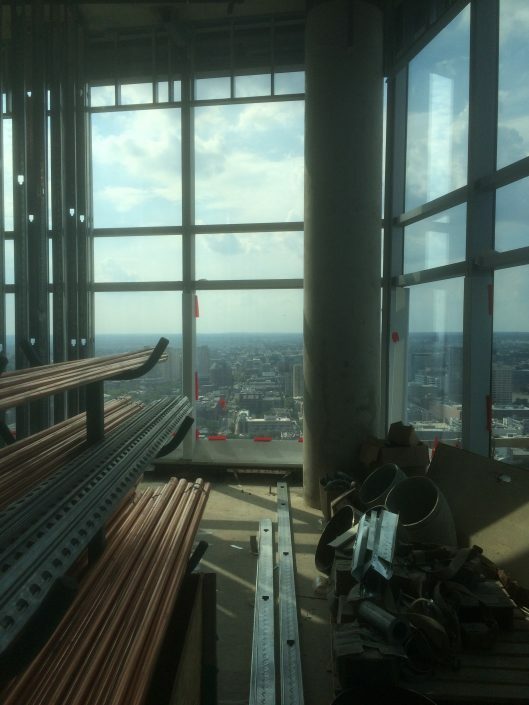 The view to the west from a.terrace. 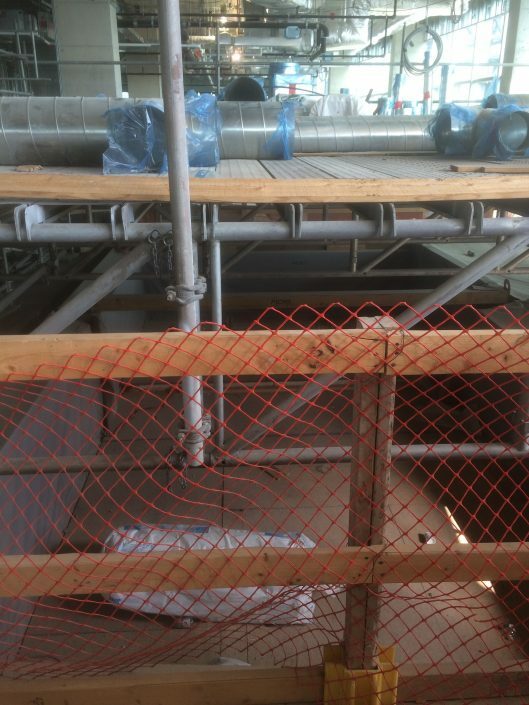 The green roof and deck will be installed on top of this base. Looking up at the hotel from the terrace. 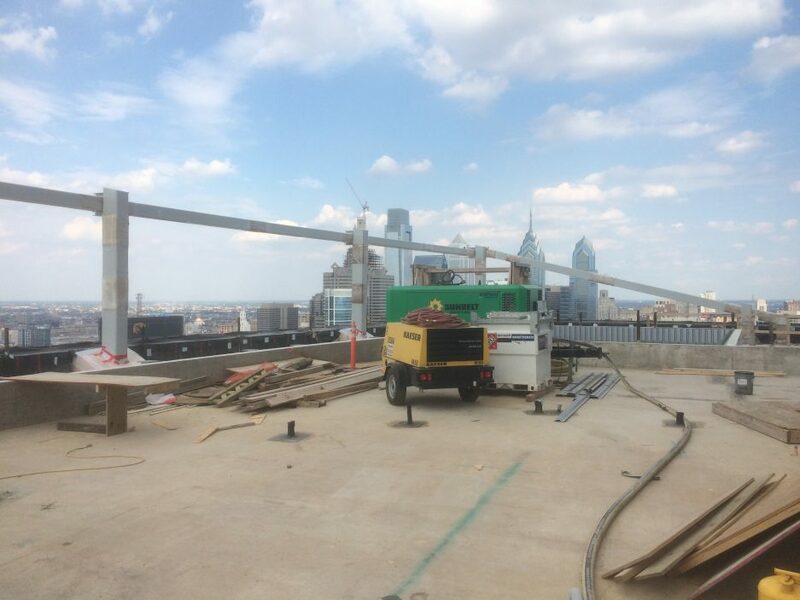 A skyline view from the future gym. Another skyline view from the gym. The view across the gym floor from the south side. 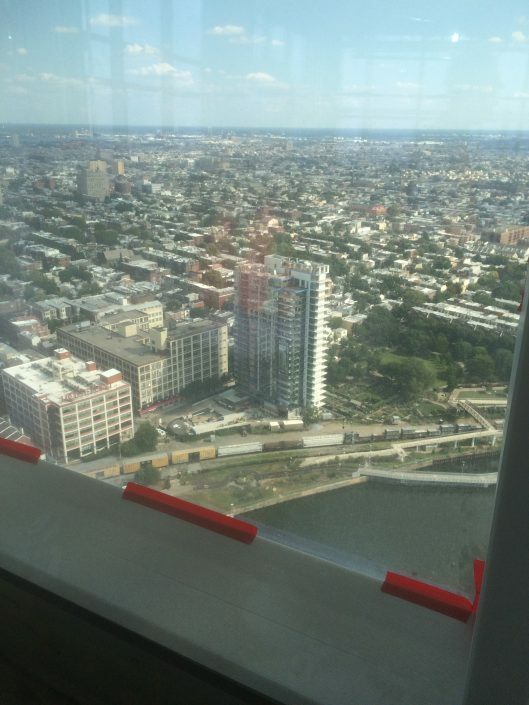 The view of the Schuylkill from the amenities-floor gym. 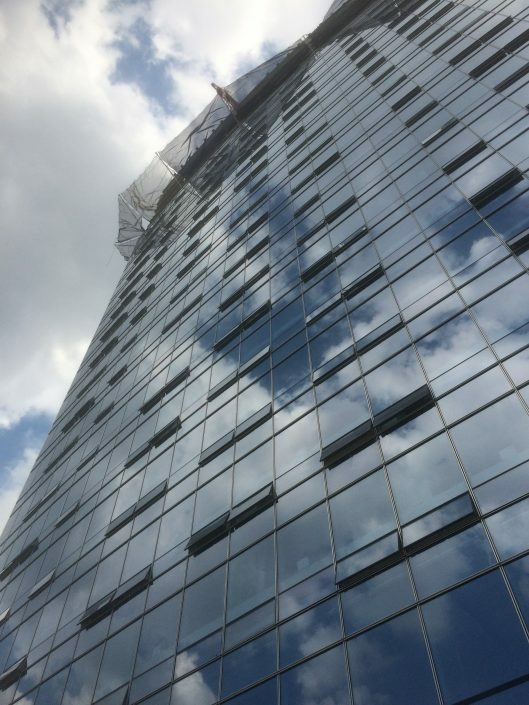 One Riverside, nearing completion, is prominent in this view.